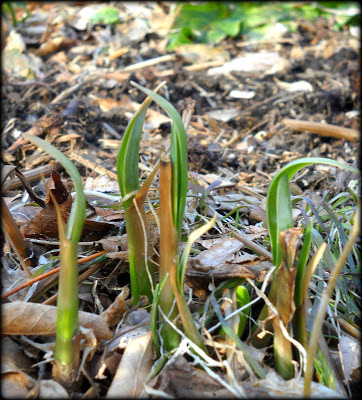 I don't want to set off alarm bells, but Sunday, before this most recent snowfall, I saw bulbs emerging in the gardens. No worries, all is well, thanks to this snow! It’s not uncommon to see little green blades poking out from the soil long before we are prepared to see our spring bulbs coming to life. They often emerge well before the predicted time and without fail, this throws some gardeners into a state of panic.Truth is, as soon as you planted those bulbs in the fall, and the soil was still warm, they were growing. As they were nestled snug under the soil’s surface they were busy pushing out roots and starting to sprout. If the weather is warm, or we experience a break in winter with unseasonably warmer days, these sprouts may break the surface. Then the cold winter days return that may damage the foliage. This will not harm the plant’s flowers, though. If you see bulb sprouts emerging you can cover them with a light layer of leaf litter or pinefines. Fortunately, this last snowfall may serve as the best insulator of all. The only true cause of alarm is when flower buds emerge too soon and are left susceptible to a late cold snap. For now, rest easy. Do not go into the garden and pull back your mulch looking for premature spouts, let the protective layer be. You are apt to do more harm than good poking around in the gardens.